Mousavi Mir Hossein, born on 2nd March 1942 is an Iranian politician, painter, architect who served as the fifth and last Prime Minister of Iran from 1981 to 1989. He was the last prime minister in Iran before the constitutional changes which removed the post of prime minister. Before that, he was the Minister of Foreign Affairs. He is currently the president of Iranian Academy of Arts. 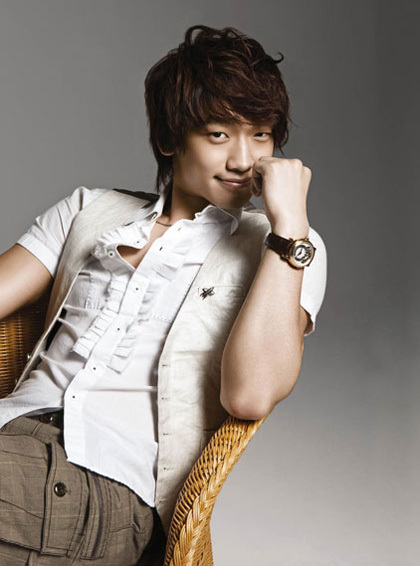 He is also a member of the Expediency Discernment Council and the High Council of Cultural Revolution, but he has not been participating in their meetings for a long time which is interpreted by political analysts and commentators as a sign of his disapproval. Mousavi holds a Masters degree in Architecture from Shahid Beheshti University (melli). 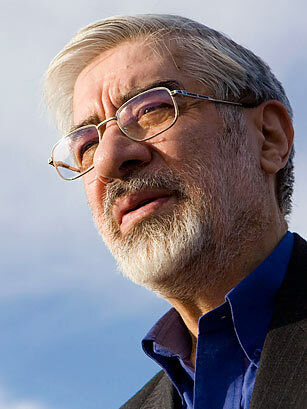 In the early years of the revolution, Mousavi was the editor-in-chief of the official newspaper of the Islamic Republic Party, the Jomhouri-e Eslami (Islamic Republic) newspaper. Mir-Hossein Mousavi is well-remembered, incredibly respected and praised by many Iranians across the political spectrum for his handling of Iran’s economy and protecting the country whilst at war with Iraq during his premiership. His strong commitment to Social Justice and Equality is well-known and is regarded to be at the core of his political ideology, which influenced policy-Making during his premiership. He pioneered the Coupon/vouchers-based economy during his premiership which resulted in a fair distribution of goods among people at the very crucial time of the war with Iraq. The economy was weakening day by day due to international sanctions by western powers who all backed Iraq during the war and demeed Iran as a threat towards regional hegemony. Mousavi refused to run for president in the 1997 elections, which caused the reformists to turn to his former cabinet minister, then a little-known cleric, Mohammad Khatami, who won in a landslide. One of the memorable tactics of the 1997 Presidential Election Campaign was the posters containing Khatami’s picture alongside Mousavi and his support for Khatami’s bid, which is regarded by commentators to be the cause of the enormous support among working class Iranians that Khatami enjoyed. Mousavi’s wife, Zahra Rahnavard, explained in an interview that the reason for him not running in the 1997 elections was discouraging messages from higher officials, a statement which possibly hints at the Supreme Leader Ali Khamenei and/or the then President Akbar Hashemi Rafsanjani. During Khatami’s administration, he served as the Senior Adviser to the President. He was considered as the possible leading candidate of the reformist alliance to run in the Iranian presidential election, 2005. But he finally declined the offer of certain parties in the reformist alliance on October 12, 2004, after a meeting with President Mohammad Khatami and the two other major members of the moderate Association of Combatant Clerics, Mehdi Karroubi and Mohammad Mousavi-Khoiniha. After 20 years of political silence, on March 9, 2009 he announced his bid to run in the 2009 Iranian Presidential Election, which has been since welcomed by many Iranians who still recall his time as Prime Minister. His intention to contest the upcoming Presidential election in June has been immensely welcomed by Trade Unions, Labour associations, grassroot activists on both sides of the political aisle and working class Iranians who feel being neglected for far too long by different administrations. Mousavi is well remembered by many Iranians for managing the country during the 1980-88 war with Iraq, and very effectively steering the country out of an economic meltdown. He has stated that his main goals are to institutionalise social justice, equality and fairness, freedom of expression, rooting out corruption as well as to speed up Iran’s pending process of privatization and thus move Iran away from what he calls “an alms-based economy”. Presidential hopeful Mousavi poses a serious pro-reform challenge to the country’s hard-line establishment and the current ultra-conservative president Ahmadinejad and has often criticized his economic mismanagement, stating that when Iran “was making profits from high oil prices, had he (Ahmadinejad) ever considered a situation when prices would fall?”. Mousavi’s candidacy as a strong opportunity to unseat the current hard-line President Ahmadinejad, as he has lost popularity even among conservatives because of his handling of the faltering economy, evaporation of civil liberties and the disastrous state of the foreign policy, as some Iranians believe that his tough anti-U.S. and anti-Israeli rhetoric has worsened Iran’s isolation and standing in the world. Checkout the ASCII Art of Mousavi Mir Hossein in the below link. Please use Lucida Console font to view the art in Notepad. Before that in Notepad go to Format and Uncheck the Word Warp and then Go to Font and Reduce the Font Size to 3 to 4 pt. Use only Lucida Console Font. 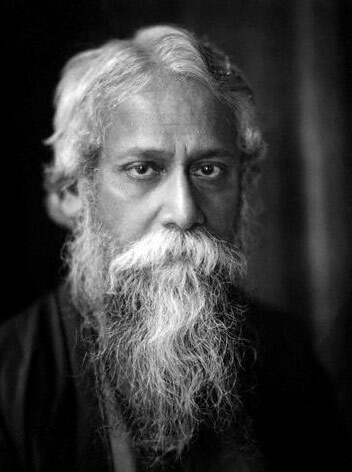 Rabindranath Tagore (7 May 1861 – 7 August 1941), sobriquet Gurudev, was a Bengali polymath. As a poet, novelist, musician, and playwright, he reshaped Bengali literature and music in the late 19th and early 20th centuries. As author of Gitanjali and its “profoundly sensitive, fresh and beautiful verse”,in 1913 being the first non-European to win the Nobel Prize in Literature, Tagore was perhaps the most important literary figure of Bengali literature. He was a mesmerising representative of the Indian culture whose influence and popularity internationally perhaps could only be compared to that of Gandhi, whom Tagore named ‘Mahatma’ out of his deep admiration for him. A Pirali Brahminfrom Kolkata, Tagore was already writing poems at age eight. At age sixteen, he published his first substantial poetry under the pseudonym Bhanushingho (“Sun Lion”) and wrote his first short stories and dramas in 1877. Tagore denounced the British Raj and supported independence. His efforts endure in his vast canon and in the institution he founded, Visva-Bharati University. Tagore modernised Bengali art by spurning rigid classical forms. 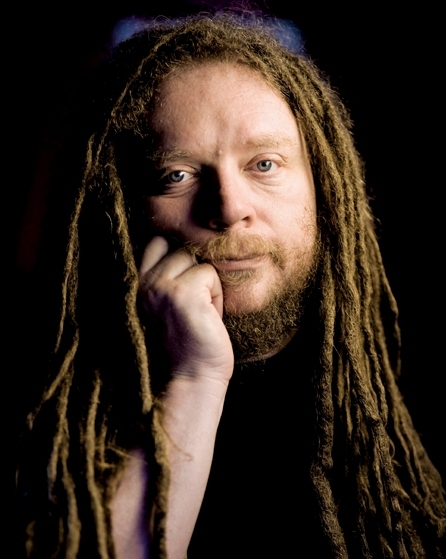 His novels, stories, songs, dance-dramas, and essays spoke to political and personal topics. Gitanjali (Song Offerings), Gora (Fair-Faced), and Ghare-Baire (The Home and the World) are his best-known works, and his verse, short stories, and novels were acclaimed for their lyricism, colloquialism, naturalism, and contemplation. Tagore was perhaps the only litterateur who penned anthems of two countries: Bangladesh and India: Amar Shonar Bangla and Jana Gana Mana. Check out the ASCII Art of Rabindranath Tagore in the Link Below. Use LUCIDA CONSOLE FONT for viewing art in notepad. Before viewing the art in notepad Just UNCHECK the WORD WRAP in FORMAT.Use font size of 3 to 4 pt. Pablo Diego José Francisco de Paula Juan Nepomuceno María de los Remedios Cipriano de la Santísima Trinidad Ruiz y Picasso (25 October 1881 – 8 April 1973) was a Spanish painter, draughtsman, and sculptor. He is one of the most recognized figures in 20th-century art. He is best known for co-founding the Cubist movement and for the wide variety of styles embodied in his work. Among his most famous works are the proto-Cubist Les Demoiselles d’Avignon (1907) and Guernica (1937), his portrayal of the German bombing of Guernica during the Spanish Civil War. 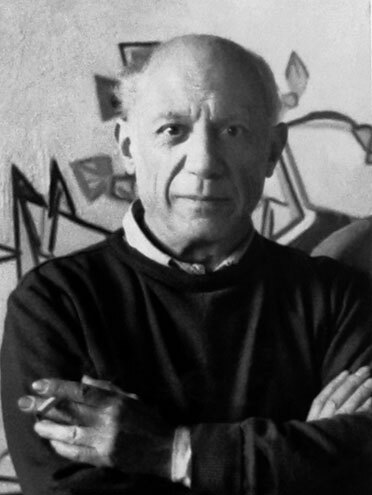 Picasso demonstrated uncanny artistic talent in his early years, painting in a realistic manner through his childhood and adolescence; during the first decade of the twentieth century his style changed as he experimented with different theories, techniques, and ideas. Picasso’s creativity manifested itself in numerous mediums, including painting, sculpture, drawing, and architecture. His revolutionary artistic accomplishments brought him universal renown and immense fortunes throughout his life, making him the best-known figure in twentieth century art. After studying art in Madrid, Picasso made his first trip to Paris in 1900, then the art capital of Europe. There, he met his first Parisian friend, the journalist and poet Max Jacob, who helped Picasso learn the language and its literature. Soon they shared an apartment; Max slept at night while Picasso slept during the day and worked at night. These were times of severe poverty, cold, and desperation. Much of his work was burned to keep the small room warm. During the first five months of 1901, Picasso lived in Madrid, where he and his anarchist friend Francisco de Asís Soler founded the magazine Arte Joven (Young Art), which published five issues. Soler solicited articles and Picasso illustrated the journal, mostly contributing grim cartoons depicting and sympathizing with the state of the poor. The first issue was published on 31 March 1901, by which time the artist had started to sign his work simply Picasso, while before he had signed Pablo Ruiz y Picasso. Pablo Picasso died on 8 April 1973 in Mougins, France, while he and his wife Jacqueline entertained friends for dinner. His final words were “Drink to me, drink to my health, you know I can’t drink any more.”He was interred at the Chateau of Vauvenargues near Aix-en-Provence, a property he had acquired in 1958 and occupied with Jacqueline between 1959 and 1962. Jacqueline Roque prevented his children Claude and Paloma.Devastated and lonely after the death of Picasso, Jacqueline Roque took her own life by gunshot in 1986 when she was 60 years old. Check out the ASCII Art of Pablo Picasso in the Link Below. Use LUCIDA CONSOLE FONT for viewing art in notepad. Before viewing the art in notepad Just UNCHECK the WORD WRAP in FORMAT.Use font size of 3 to 4 pt.